A master bedroom should be a retreat, a space that draws you in to rest and relax at the end of the day. Our little room didn’t feel like a sanctuary at all when we first moved in, but it sure does now! Today I’ll share a few tips for how we took a basic room and transformed it into a cozy, calm and relaxing sanctuary. We found several of our new accessories on a recent visit to one of my favorite stores, World Market! Come see all of the details, tips, and sources, below. A neutral color palette can transform an ordinary room into an soothing oasis. 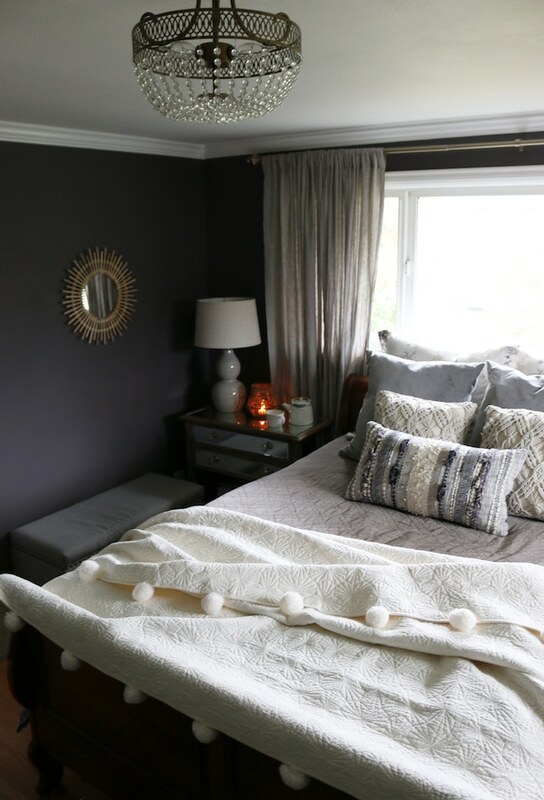 The dark matte gray plum walls add drama while still playing up the cozy factor. 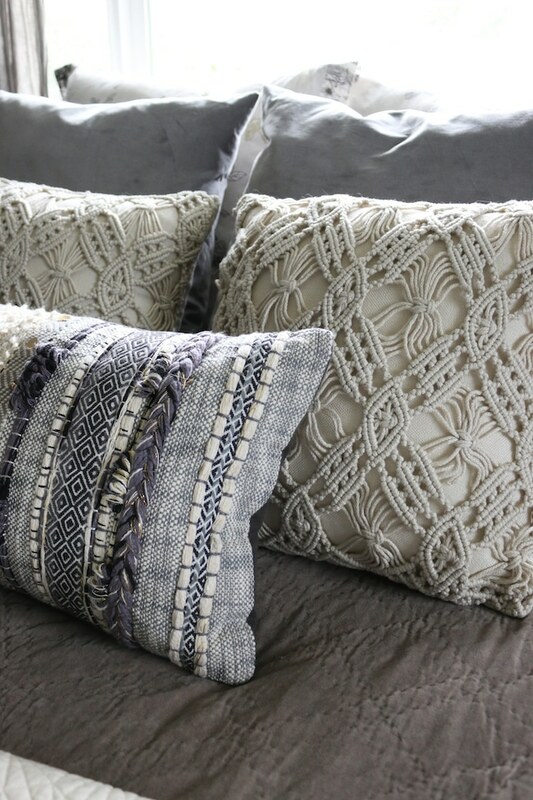 Bring interesting textures and unique embellishments to the bedding, like our new pom pom quilt and beautiful macrame and velvet pillows from World Market. 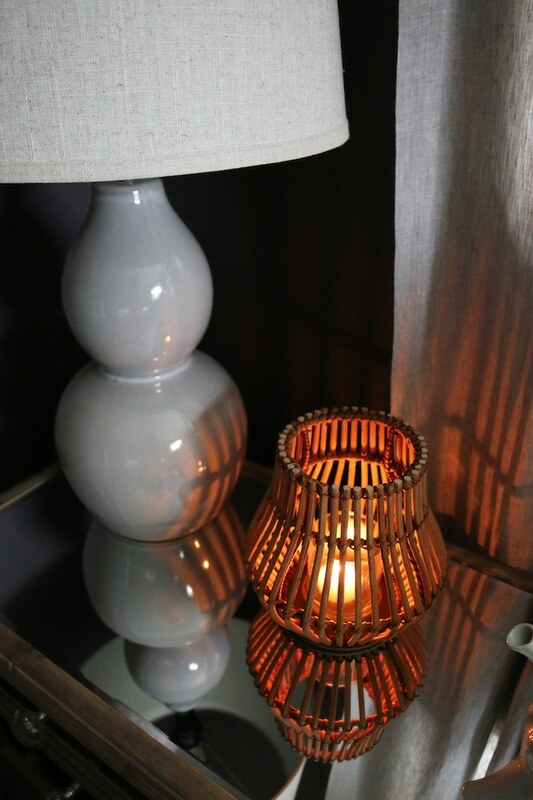 Set the tone for rest with spa-inspired accessories such as a candle (battery-operated candles work great!) 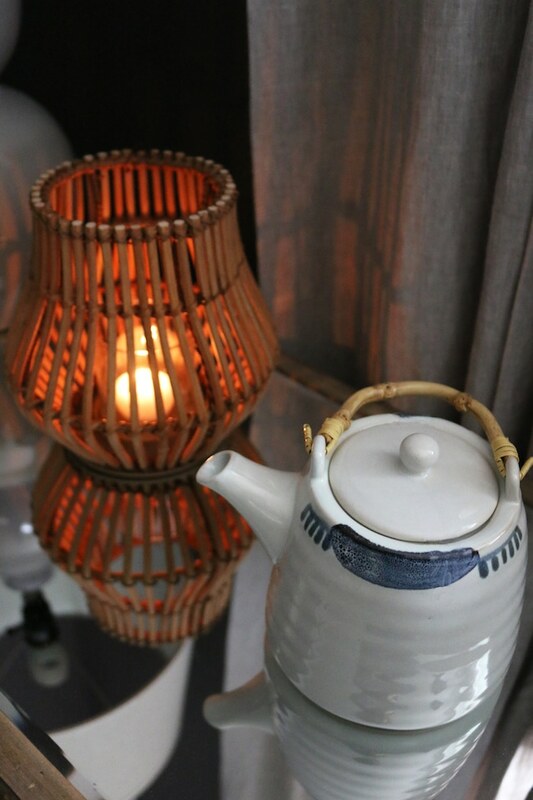 and rattan accessories. Give yourself the same amenities you’d offer a guest. 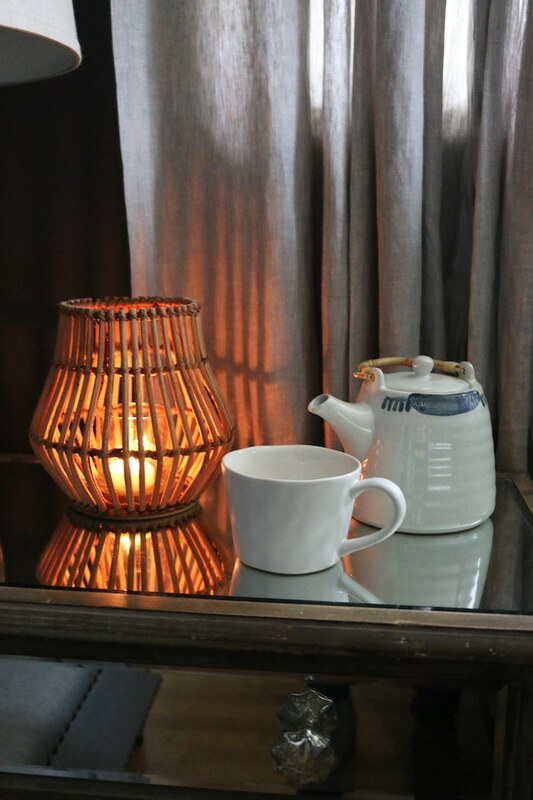 A clean room, fresh bedding, comfortable pillows and even a pretty teapot to take to your room at the end of the day. 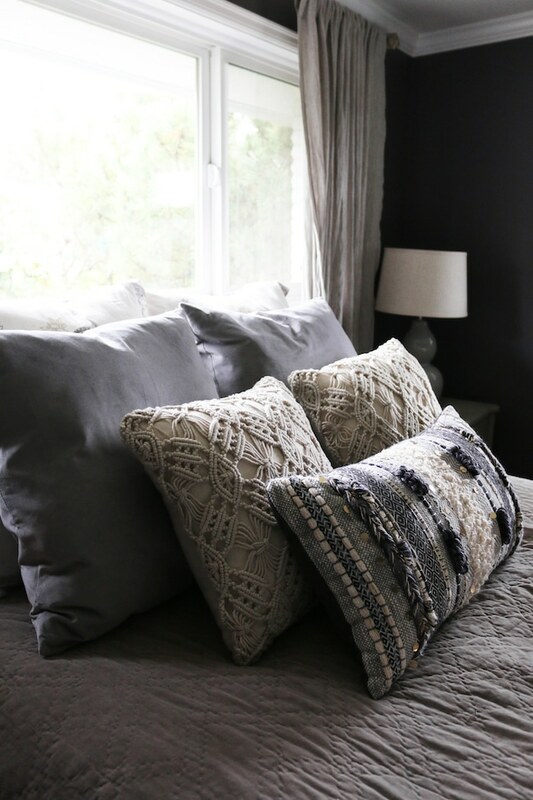 What are some ways you make your bedroom your sanctuary? Believe it or not, and this is kind of embarrassing to admit, but just making our bed each morning has really made our Master our sanctuary! We never had a first floor master before moving in this home, and well, it was just so easy to just pull the covers sloppily up and call it a day. lol. Now, I take the time ( like 3 min vs 1 min. lol) to make up our pretty bed complete with throw pillows each morning. 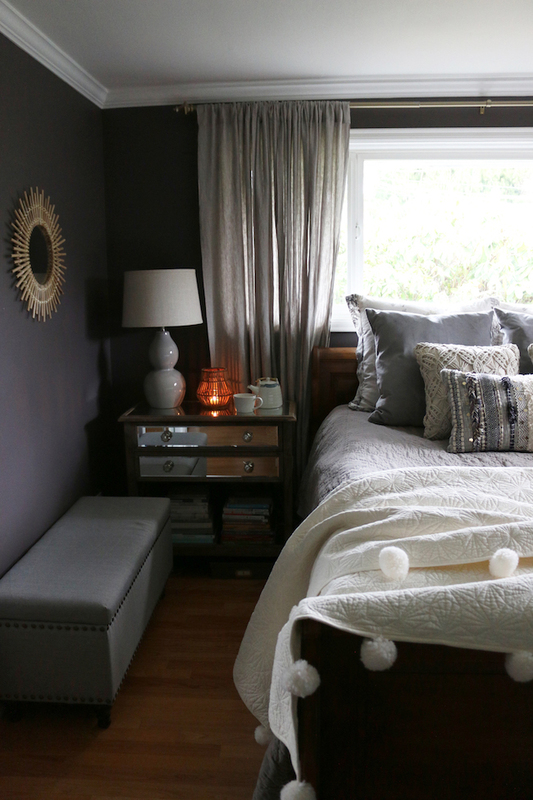 Melissa, I love everything about your bedroom! So cozy and beautiful! I particularly love the chandelier! Such a regal touch, and why not? It IS the Master. ❤️ I would love to do that, but hubby wanted a ceiling fan. Whomp, whomp. lol. Ha, so funny on the one minute verses three! Worth the extra two minutes hahah. We had a ceiling fan in our last bedroom, too. It was not as romantic looking but we actually loved it because it kept our room nice and cool in the summer! 1) Where do the dogs sleep? I imagine they are not sleeping in your room with all that beautiful bedding. Our dogs sleep in our room and 2 of 3 are on the bed so I feel like I cannot have a truly luxurious bed due to the dogs. I would not change having them there, though. 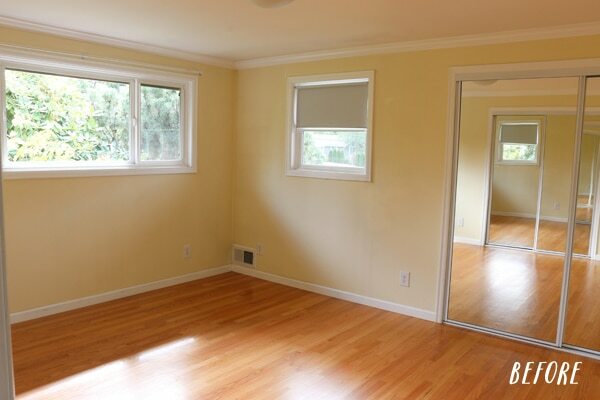 2) I don’t see any room darkening window coverings and the curtains are not thick. Are you and your husband early risers or does light not bother you while sleeping? I prefer to have a very dark room for sleeping and was just wondering about the window situation for your room. Thanks very much! The room looks very serene and cozy indeed. hi- i’d like to piggyback a bit on the dog question. in general, how do you deal with the dogginess of a house without going crazy? maybe yours are less messy/more well-behaved than mine, but for me the most challenging part of maintaining a clean and serene home is dealing with dog bowls/slobber/scratch marks on my floors and windowsills/ hair/etc. maybe i just need to meditate. how do you manage your pet spaces and detritus??? I love the paint color! Could you please share brand and color? Sure, it’s Black Frosted Plum by Glidden! It’s a really nice moody color, I find it is not as foreboding as a dark gray or black even though it has a similar feel. I think the warm plum tone keeps it feeling inviting and friendly! 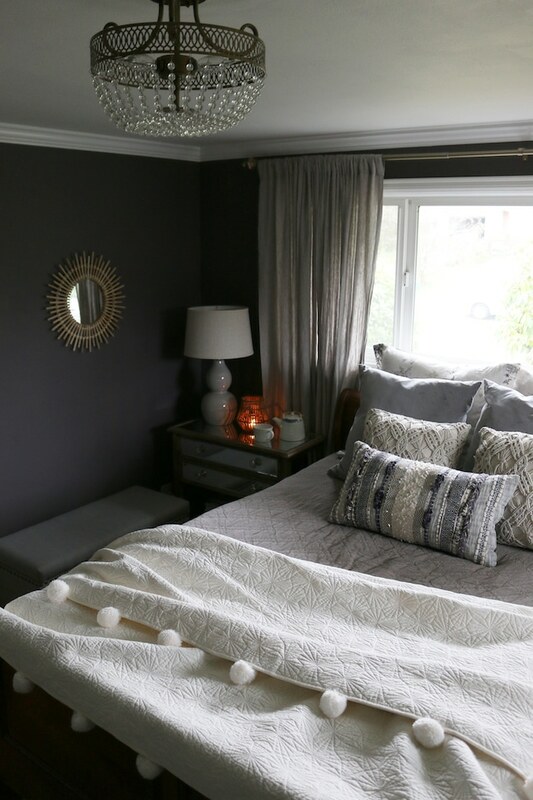 This is a timely post as we’re in the middle of re-doing our Master bedroom. Can you tell me where you found your curtains and their color? 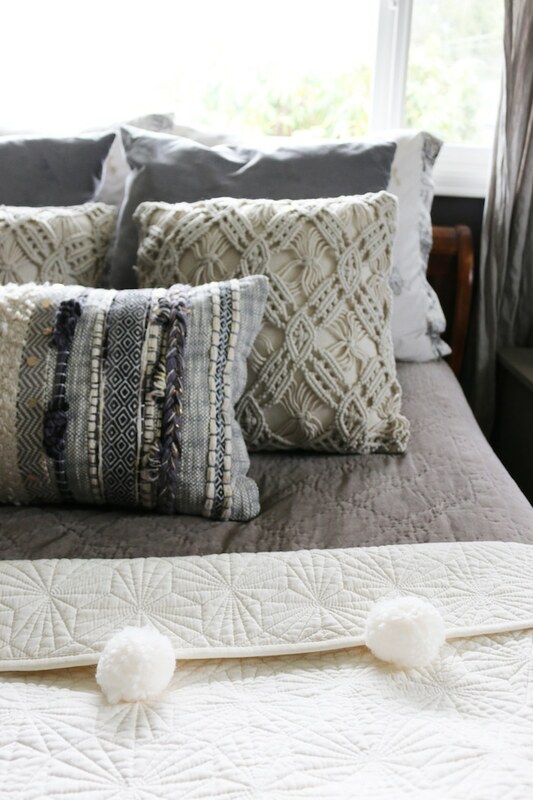 Love the pom-pom quilt! 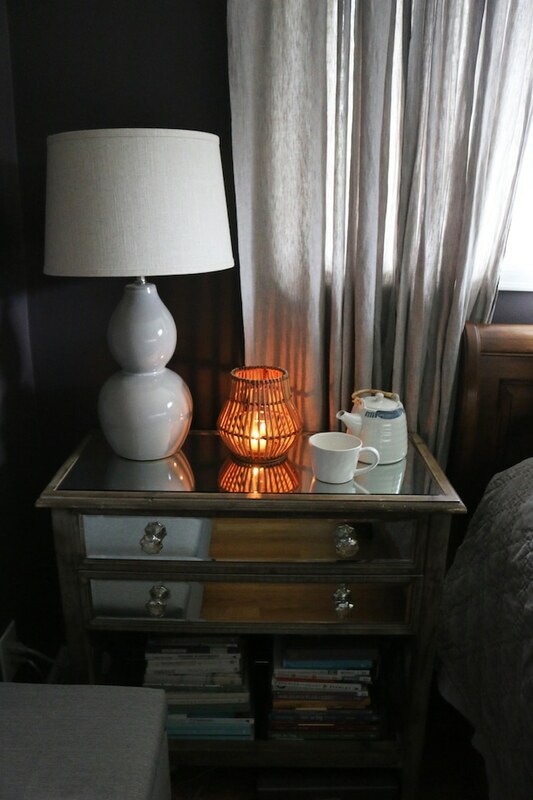 You’ve done a great job making your room hygge-fied! The chandelier is a GREAT touch! 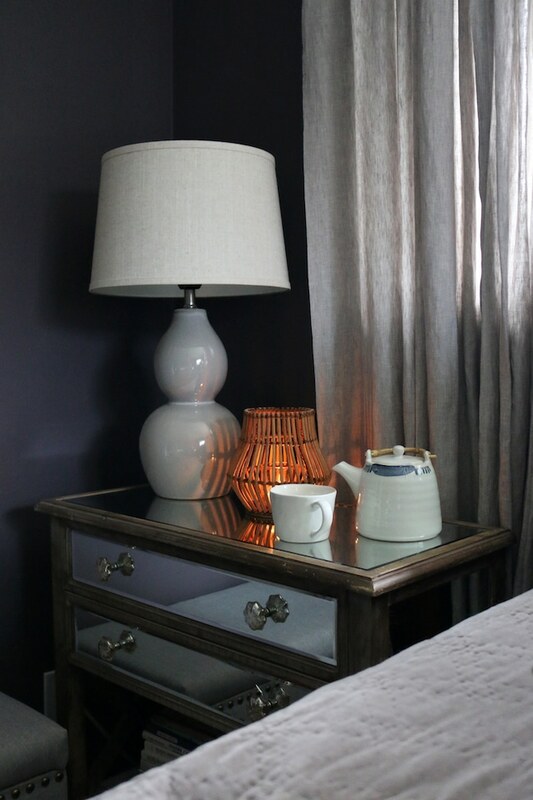 We keep our bedroom a sanctuary by eliminating electronics & clutter and keeping the furniture to the bare minimum. This gives my mind peace to prepare for sleep. Next is making the bed oh-so-comfortable and inviting, then having only the essentials in/on the nightstand. Just writing this makes me ready for bed! <3 Sounds so serene and restful! Love this post … we’re getting very close to the end of a renovation adding a downstairs master bed/bath/closet. I think I’ve settled on my bedding … new bed to arrive on Wednesday! 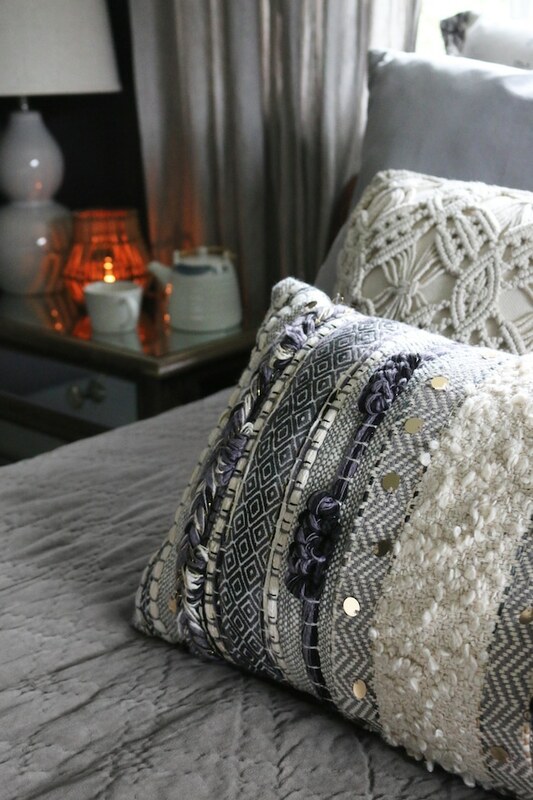 Love these tips for how to cozy it up once we get settled. I think it’s from Lowe’s or Home Depot, one of those two, I’ve forgotten which :). 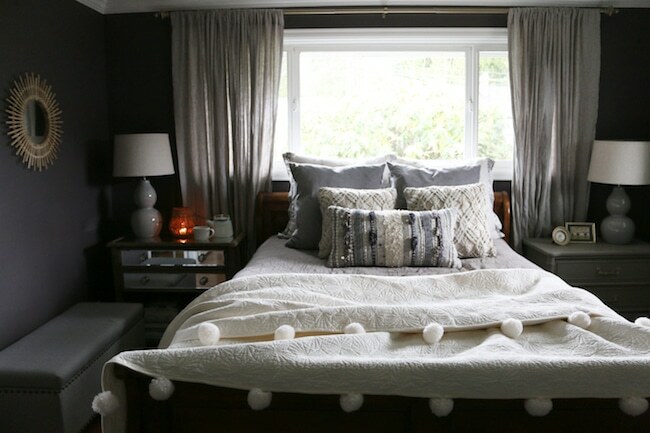 Your bedroom looks so calm and cozy! A daily intention is to make the bed first thing every morning. Since my master is very small, I keep it simple. I snugged my pine bed into a corner, have a white bead board bureau and bedside table. I added a stack of wicker baskets for texture and storage, as well as a small white bench with natural pine top. No overhead lighting to keep it serene. Thank you, Susie! Your room sounds delightful! Without a doubt my bedroom is my sanctuary as well. It’s the one place in my home where the color palette is completely neutral and serene. I invest in quality linens, which are changed once a week and the room given a good cleaning. Now I’ve added my oil diffuser which just adds another element of calm and peace! In the warmer months I love to sleep with the windows open and listed to the sounds of the creek and the wind in the trees – that’s heaven to me! Sounds perfectly dreamy. The diffuser is definitely one of my favorite calming rituals, too. I’m so happy you received yours, now! I’d like to know what, if anything, you did with the mirrored closet doors. I see a night of sewing pom poms (on my plain white quilt) in the future! So cute! Your master is just so pretty and inviting!! I have lots of color in my bedroom, which I love, but now you’ve got me rethinking it!! Where are your curtains from? I love them. So cozy!!! And your chandelier is to die for!! As is the pom-pom throw, Melissa. Finally, I made our bedroom a place I love to go. All it took was needing a place for our skinny Christmas tree and realizing that if I was going to share it on the blog with the world I needed to act fast. It was the best decision ever. 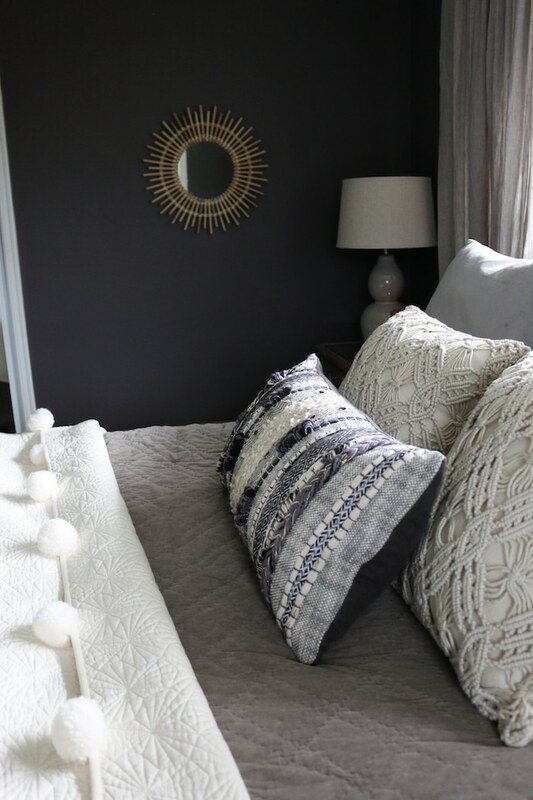 Love the chandelier too, and the pom pom quilt, and the mirror. Enjoy this lovely, warm space– just like you! I’ve learned that dark colors in a smaller space work magic. My bedroom wall color is cranberry, and the small space is super cozy. Thanks for sharing. 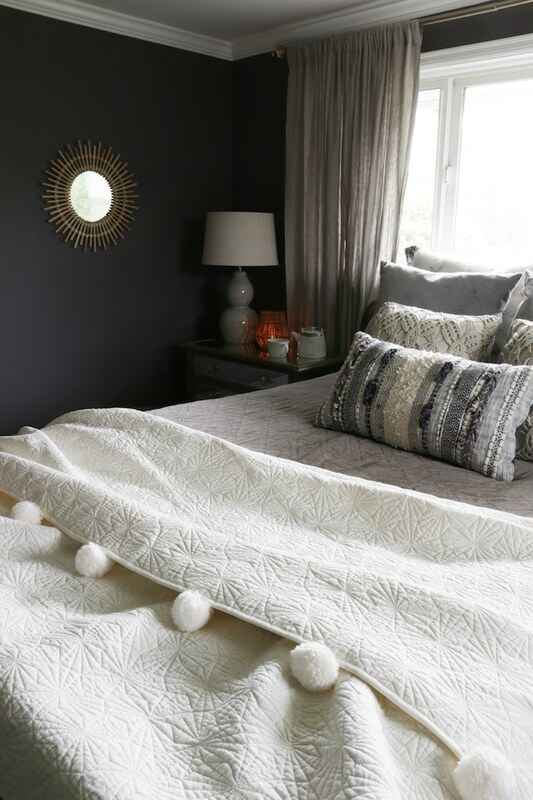 Your master bedroom looks quite cozy! My faves are the chandelier, paint color, and mirrored night stands. We recently relocated our master bedroom and to make it extra cozy we added a dimmer switch to the lighting and some wall sconce lighting. To make our bed more inviting, we swapped out our traditional bedding for a velvet pintuck duvet and added a faux fur blanket that drapes over the lower portion of the bed. Thanks for sharing the pics. Is it time for bed yet?! Looks great! Was wondering where you bought the mirrored night stand? I got it from HomeGoods! Lovely room. Where did you get your curtains? Beautiful indeed! Can I ask where you got the lamps from? Thank you! Those were from Target! :) Thank you!